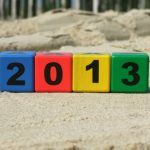 When it comes to parenting, scheduling and maintaining structure is essential. I’ve raised my now 18 year old son up on a regimen that he had come to rely on and get used to. And now that he is in Los Angeles on his own, he will tell you he misses the structure he once had in my home. Parenting is hard enough, but you can help make it easier by offering you and your children order in a chaotic world. What helps me each weekday evening is having a list of to-do items that my 9 year old daughter is responsible for. 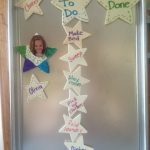 The checklist is something that she completes each weekday night before bed, and must turn in to me in order to earn time on the computer and time watching TV, activities, etc. Putting it in her hands makes her responsible for her chores, homework, hygiene, etc. I spend less time telling her what to do because she knows what is expected. And because she likes the satisfaction of checking off things on her list, her Daily Checklist is something she enjoys doing—it gives her a sense of accomplishment. 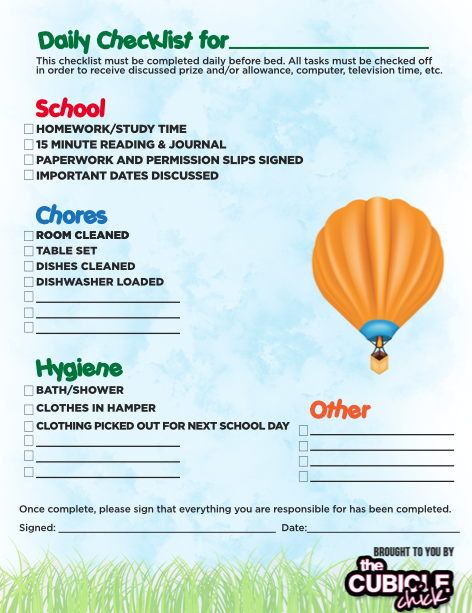 I created a printable that you can use with your child and edit and fine-tune based on you and your child’s needs. This Daily Kids’ Checklist is great for school aged children 6 and up. For kids younger, you can help your child fill out the sheet, which can also give them a sense of responsibility. This checklist does wonders in my home. I hope it also does the same in yours!